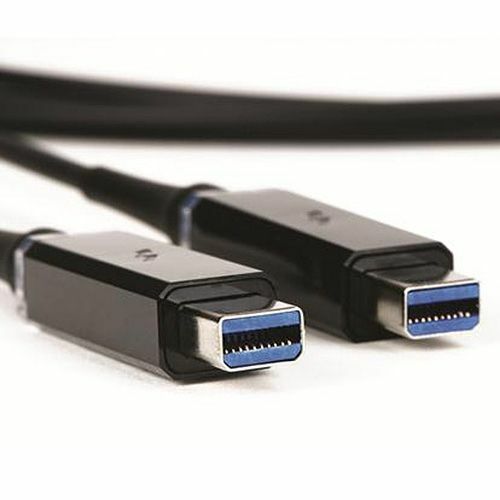 Whilst the USB-C connector allows a lot of flexibility, there are a number of different cable types. If working with Thunderbolt 3 the cable should have a 3 on the plug. Passive Thunderbolt cables are short, however they can be used to connect Thunderbolt or USB hard drives. If the cable is 1m or 2m, then it's probably an active Thunderbolt cable. The plug is longer to house the active components. Note that longer active Thunderbolt 3 cables do not support USB 3.1. The connection will be USB-2, so the transfer speed will be slow. The top screenshot shows a G-Tech drive connected to the Mac using an active Thunderbolt 3 cable. The top screenshot shows a G-Tech drive connected to the Mac using an passive Thunderbolt 3 or a USB-C cable. Regular Thunderbolt cables are available up to 2m long, this is fine for connecting desktop devices. However if you have something like a RAID or an LTO library then you will want to put this in a machine room. Corning make optical cables which have identical performance with lengths from 5.5m up to 60m. They are very durable and flexible. We use them at trade shows, also at the YoYotta office. This allows us to have an equipment rack with various LTO libraries downstairs, linked to a Mac upstairs without sacrificing any performance. 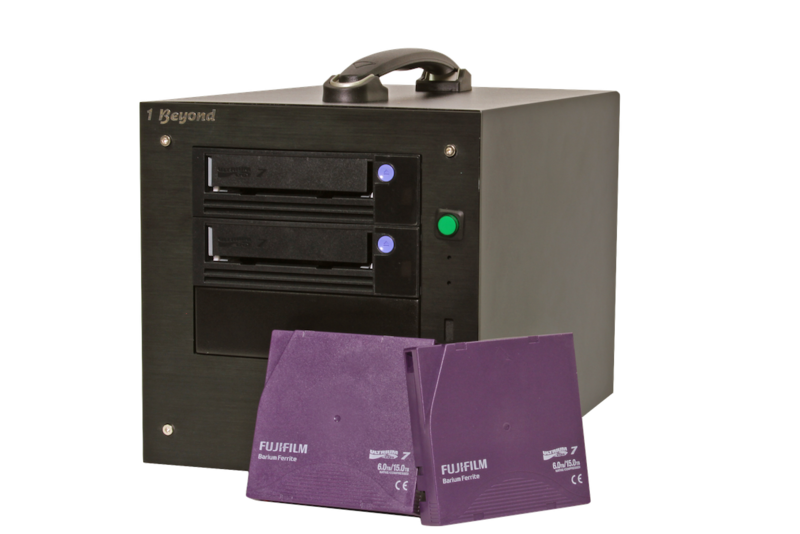 1 Beyond make a range of LTO enclosures. Their latest unit is the compact ThunderTape 3 that is shown here. The ThunderTape 3 can have two LTO drives, plus a RAID. It has a Thunderbolt3 or Thunderbolt2 interface, so easier to connect to your Mac. Together with YoYotta LTFS you can make two or more copies in parallel. 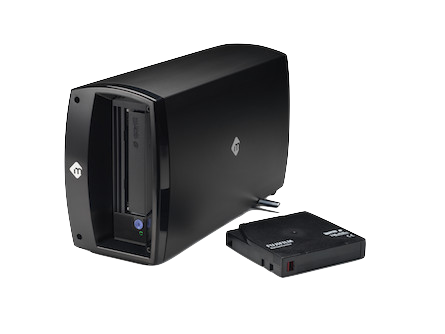 The mLogic mTape has an IBM LTO drive and a Thunderbolt 2 interface with 12V power. Just connect it to your Mac using Thunderbolt, run YoYotta LTFS and get archiving. A lot of our customers use a second LTO drive to make two LTFS copies in parallel. mTape Thunderbolt has a SAS output suitable for a matching mTape SAS drive. Just remember to use a short SAS cable to connect the two. 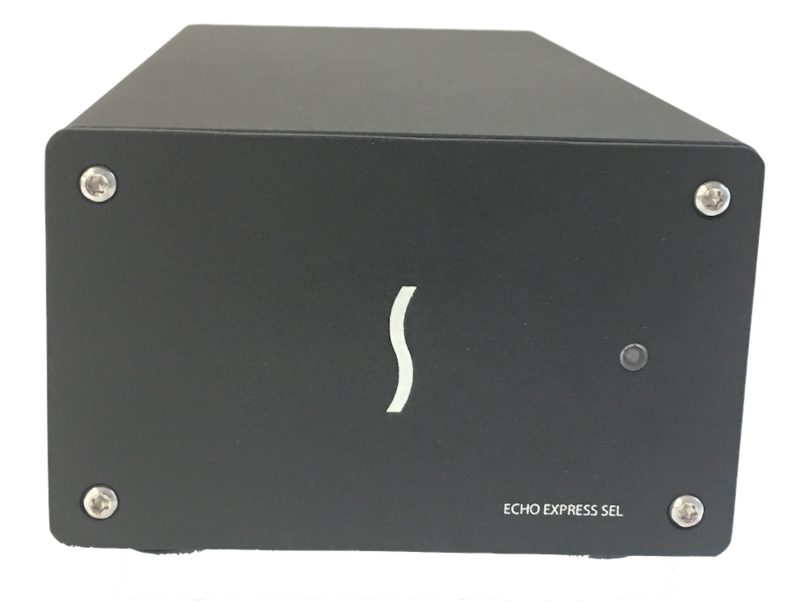 The Sonnet Echo Express SEL is a compact Thunderbolt enclosure that holds a PCIe card like the ATTO H680. A lot of our customers use this to connect to a desktop SAS LTO drive or tape library. Get the Thunderbolt 3 unit as this means that there is plenty of bandwidth for multiple LTO drives and also daisy chaining other Thunderbolt units. The Apple TB3 -> TB2 adaptor allows connection to older Thunderbolt 2 Macs. There are also other units that hold more than one card.